I have always loved stained glass, from the very first time I saw one of the majestic windows in an old church. I also love colors, which is probably why I'm so attracted to the beautiful windows. I'm in the process of creating a new book called Stained Glass Mandalas. It's a coloring book with tidbits of stained glass history and other info incorporated in it--and that's what gave me the idea for this post. The earliest origins of stained glass is sketchy. Between 2750 and 2625 BC, Egyptians artisans made glass beads by winding a thin string of molten glass around a removable clay core. In the first century AD, the Romans use glazed glass for windows. They cast glass slabs and used blowing techniques to spin discs to make cylinder glass, although their glass was irregular and not transparent. 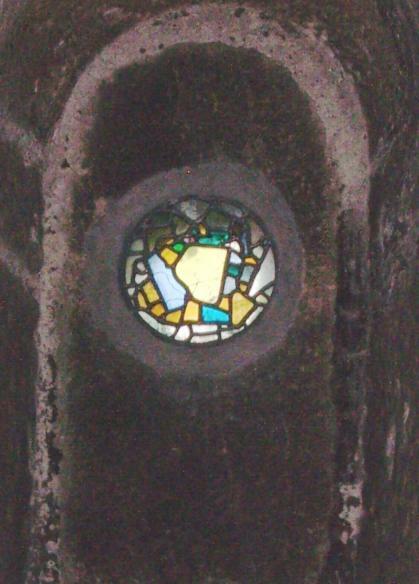 One of the oldest known examples of multiple pieces of colored glass used in a window, shown below, was unearthed at St. Paul’s Monastery in Jarrow, England, founded in 686 AD. The oldest complete European windows found are believed to be five relatively sophisticated figures in an Augsburg Cathedral in Germany. The five windows are no longer in their original setting and have been moved to a museum and replaced with copies. The windows are fired glass paintings, which utilize line and tonal shading, and they are made of bright, varied colors of glass. 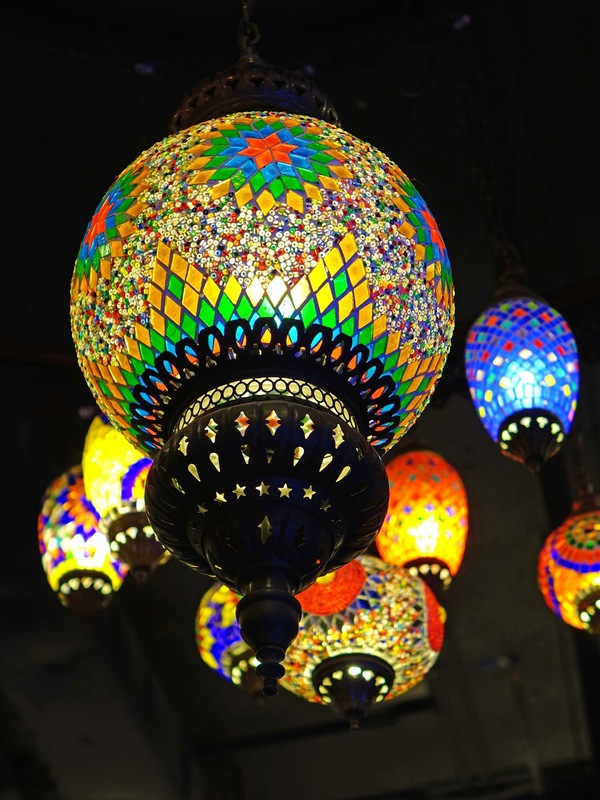 Authorities believe that Arabian glass windows appeared in the second half of the thirteenth century. Pieces of glass were either inserted into intricately pierced marble or stone, or they were glazed in plaster before the plaster had set. Ribs of iron were often used to strengthen the plaster. Arabian filigree windows moved into Europe when the Moors entered Spain. In Europe, plates of pierced lead replaced the plaster grillwork. The first of these had no glass in the decorative openings, but later small pieces of glass were attached using strings of lead. 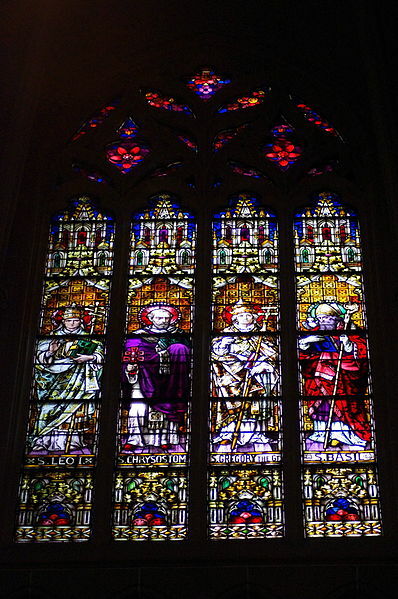 Stained glass was used in secular buildings during the Renaissance period. Historic scenes or heraldry were placed in town halls and small panels. 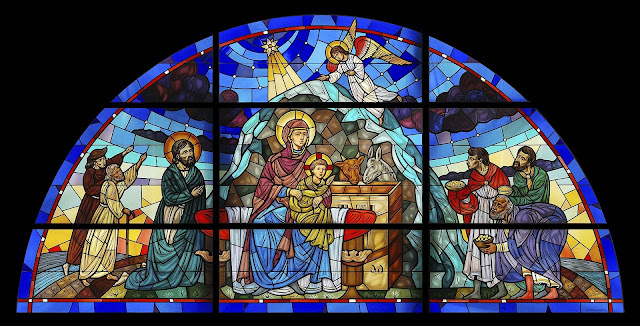 The colorful windows were used in early Catholic churches mainly to depict scenes from the Bible because the majority of the people then were illiterate. 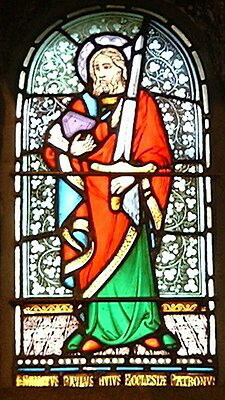 Stained glass had a low ebb between the late medieval age and the nineteenth century. The reasons were religious, political and aesthetic. 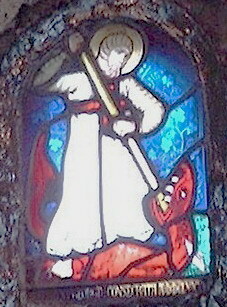 The Church had been the principal patron of stained glass, however, the new Protestants were hostile to elaborate art and decoration in their places of worship. 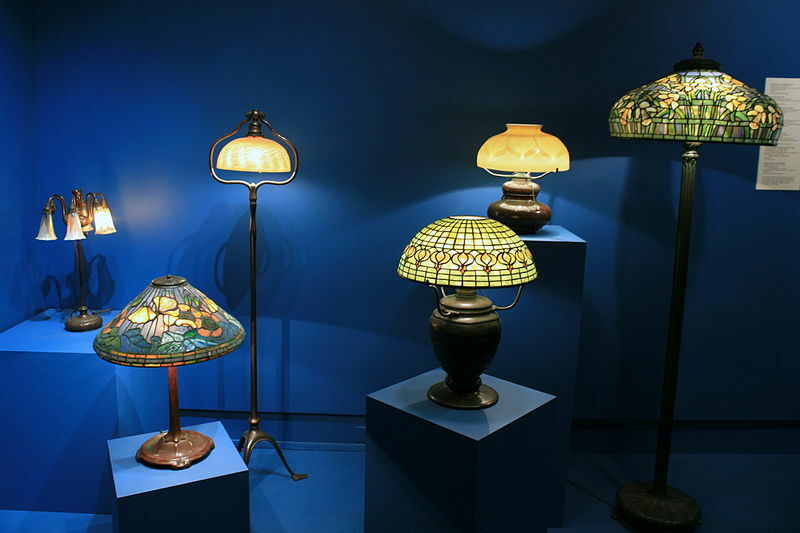 After a 200 year decline, glassmakers Louis Comfort Tiffany (1848-1933) & John Farge (1835-1910), revived interest in stained glass with their colorful and unique products, and it has been popular ever since. The largest handmade stained glass window is believed to be in the Roman Catholic St. Mary’s Cathedral Basilica of the Assumption in Covington, Kentucky. It measures 67’ x 24’. The picture below is one from that church. This is only a partial history of stained glass, touching on the highlights and most interesting details. 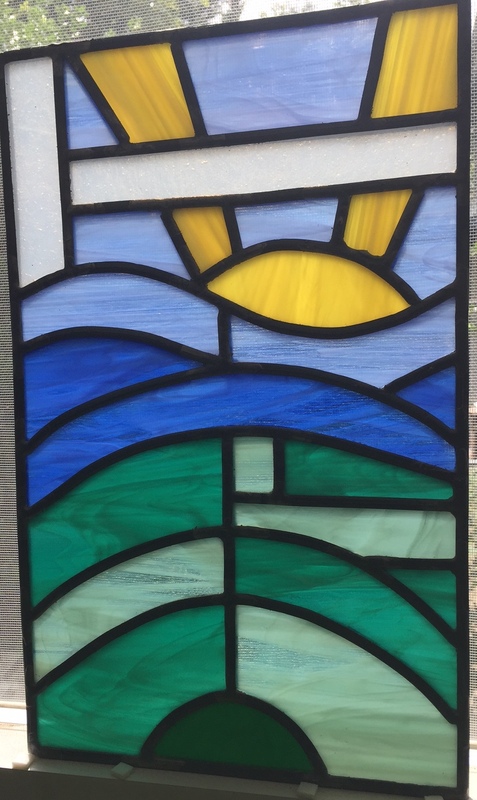 I've dabbled in stained glass, but I'm a bit hesitant to show you my first project. I am proud of it, but you just can't compare it to the magnificent windows above. I thought you might like to see part of the process in making a stained glass project. The pattern of the design behind my project is called a cartoon. 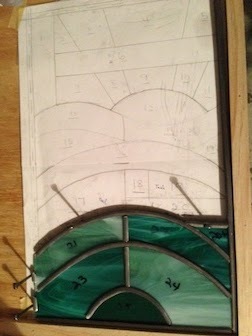 In the class I took, we made a duplicate copy and cut out the pieces, which became the patterns for cutting the glass. Once all the glass was cut, we begin to put the pieces together, one at a time. The lead had to be cut to fit each piece of glass as you go along. It can be tricky to get a good fit on smaller pieces and curves. The nails used to hold the glass tight are actually horseshoe nails. In the second picture, you can see that I've already soldered all of the lead and joints. On the finished project, you can see that I used a chemical that turned the solder black to give is an antique finish. Bestselling author Vickie McDonough grew up wanting to marry a rancher, but instead, she married a computer geek who is scared of horses. She now lives out her dreams penning romance stories about ranchers, cowboys, lawmen, and others living in the Old West. Vickie is a best-selling author of more than 45 published books and novellas, with over 1.5 million copies sold. Her novels include End of the Trail, winner of the OWFI 2013 Booksellers Best Fiction Novel Award. Song of the Prairie won the 2015 Inspirational Readers Choice Award. Gabriel’s Atonement, book 1 in the Land Rush Dreams series, placed second in the 2016 Will Rogers Medallion Award. 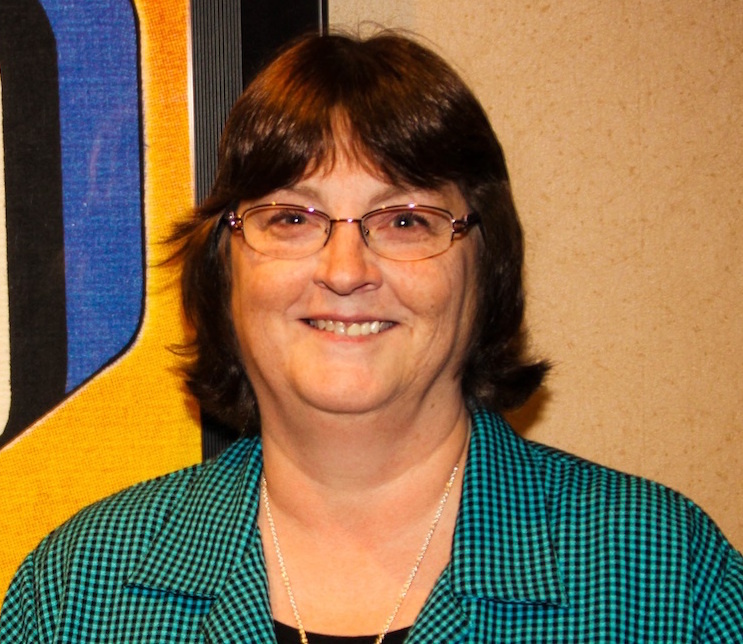 Vickie has recently stepped into independent publishing. Wow! How interesting, and I love your project! Thanks! I was thrilled to find colors of glass available that were just what I had envisioned for the project. Oh my, how very interesting! Thank you for sharing! I love stained glass. I have a piece hanging in my living room window and also a lamp. Your work is beautiful! Thanks, Melanie. I have several stained glass lamps too. There's soothing peaceful and soothing about them. Wow! 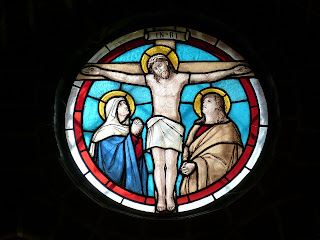 I really enjoyed this post with the history of stained glass. Your project is so neat, Vickie. Excited to know you are creating a new coloring book, Stained Glass Mandalas. Thank you for sharing. Thanks, Marilyn. It amazes me to think how making stained glass hasn't changed all that much for centuries. I was really excited to be able to read this post this morning! The coloring book sounds wonderful! My hubby's grandmother took a class in making stained glass items, and I treasure the few pieces that she made for us. Thanks for a fun post!! That's so fun to have glass pieces your grandma made. I'd love to see them. Hey Vickie! WOWZERS! This is a fascinating post! I LOVE stained glass. My Mom made some pieces several years ago. A friend did a gorgeous butterfly piece that went in to a concrete bench. Thanks, Caryl! I love it too--most of it, anyway. Do you have pictures of your mom's pieces? Stay safe! I pray you don't have to be out of your home for long. Thank you for sharing about the history of stained glass! Also, your project is lovely! My daughter has made a number of smaller stained glass pieces, she enjoyed crafting them but has said it was tricky. I'll look forward to your next book! Thanks! 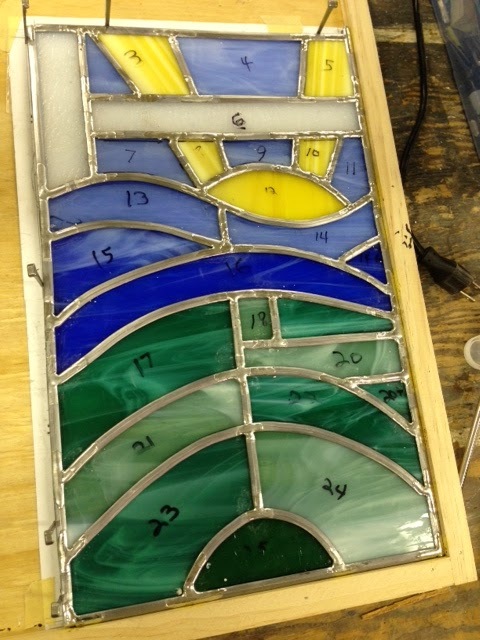 Stained glass isn't easy to do. I have trouble with cutting the glass, but if I keep at it, I'll get better. Loved this post. In the last year I read Clara and Mr. Tiffany, which tells enough about the process (and the women who designed and worked for Tiffany) that I was newly impressed, even though I remember standing in open-mouthed wonder at the stained glass in European cathedrals. Fascinating stuff! You've done well, Vickie. Very nice use of colors.